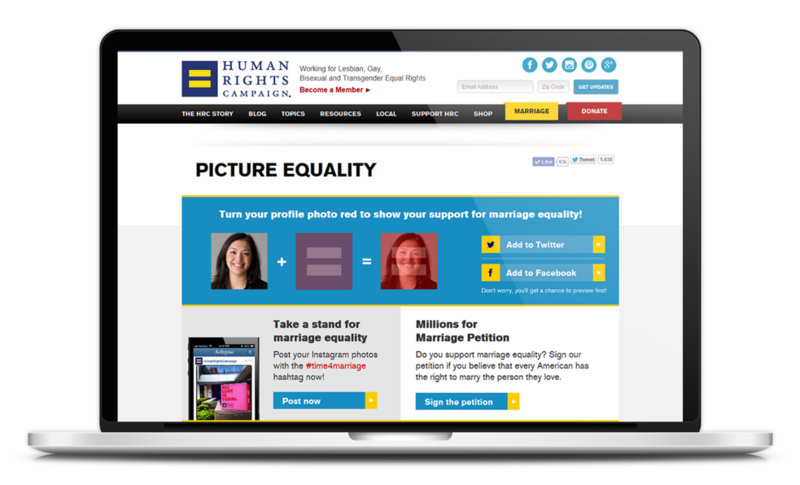 Available via a subdomain of hrc.org, this microsite allowed people to overlay their profile pictures with a red equals sign to show their support for marriage equality. In total, over 38,000 profile pictures were overlaid across Facebook and Twitter, exposing the campaign to 2 million friends and followers. HRC were also able to include custom links to their petition and Instagram profile on the page, as well as build their email newsletter list via an email collection field. Since 2009, over 300,000 brands, charities and individuals have used to Twibbon to increase awareness, raise money and create buzz around their campaign on Facebook and Twitter.